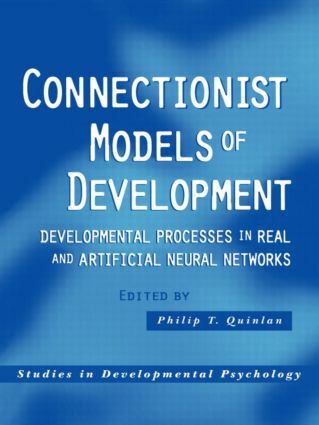 Connectionist Models of Development is an edited collection of essays on the current work concerning connectionist or neural network models of human development. The brain comprises millions of nerve cells that share myriad connections, and this book looks at how human development in these systems is typically characterised as adaptive changes to the strengths of these connections. The traditional accounts of connectionist learning, based on adaptive changes to weighted connections, are explored alongside the dynamic accounts in which networks generate their own structures as learning proceeds. Unlike most connectionist accounts of psychological processes which deal with the fully-mature system, this text brings to the fore a discussion of developmental processes. To investigate human cognitive and perceptual development, connectionist models of learning and representation are adopted alongside various aspects of language and knowledge acquisition. There are sections on artificial intelligence and how computer programs have been designed to mimic the development processes, as well as chapters which describe what is currently known about how real brains develop. This book is a much-needed addition to the existing literature on connectionist development as it includes up-to-date examples of research on current controversies in the field as well as new features such as genetic connectionism and biological theories of the brain. It will be invaluable to academic researchers, post-graduates and undergraduates in developmental psychology and those researching connectionist/neural networks as well as those in related fields such as psycholinguistics. Does Visual Development Aid Visual Learning?